I had extraordinary amount of combat sites in the N110 system (C1 with highsec static) and did them. You probably know that in wormhole space there is no bounty on the rats, nor any missions to kill them. All the income is from loot and salvage, so if you don't like blitzing missions, running wormhole sites is probably the best for you. I wasted lot of time on them, because I had no idea what I'm doing, but from the speed I was gaining I'm sure that someone with routine can earn 100M/hour doing them. Their main plus over missions is that they are in normal space, without any gates. You just fleetwarp your little squad of alts, drop tractor unit, kill the sleepers, loot, salvage, warp. However - unlike highsec missions or nullsec anomalies - wormhole space sites are limited. You can't just farm them until you had enough. You can do the available ones and then it's over. Only a few spawns every day. You can increase the available pool if you are living in a C2-C1 or C2-C2, farming the connecting systems provided by your static, but then your PI income/hour suffers from the worse hauling opportunities. Even if you go this way, your income will be limited by luck and can't play on your own schedule. Today you have 3 hours to play? No sites at home, no sites in the static, you roll it, get a PvP gang on the other side. Just enough time to update your skills? The static leads to a towerless system with 15 sites and the hole will close before you can play again. So, while I wouldn't suggest you to ignore your sites, especially if you are new and 100M is a lot of money for you, I also wouldn't suggest to focus on them. Consider them a little bonus, a lucky gift, but not a major income source. It is of course not true for higher level wormholes. I'm still sure that the main income sources of lowbie wormholes are the PI and maybe mining. I would assume that lowbie players don't even have the skills/ships to run those sites, so they would have to, unfortunately, either skip them or do them a lot slower than you did. You assume incorrectly - depending on what qualifies as a lowbie, of course. C1 Sleeper sites can be run with a single Drake. A Navy Drake cuts down running time a lot. 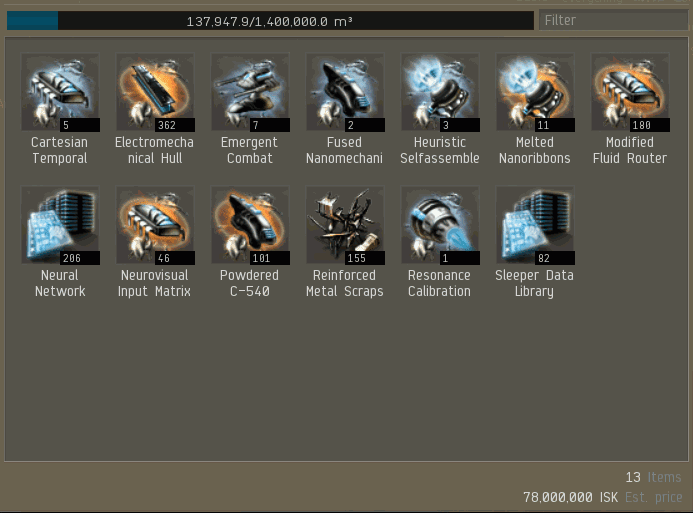 Mining is really good ISK. Weather you refine at your POS or nit is a matter of taste. I'm sure GG will go for the ISK/hour option which is moving the ore to Hi for refining. PI makes good income and is a cornerstone in being self-sufficient in regards of POS fuel. As for the advice to not run the sites... Would that not make the player a Zombie? I don't get it. If you lived in something with a static C2 you are nearly guaranteed consistent highsec access. Furthermore you would have wormholes that would support orcas rigged out for maximum hauling capacity. AND a second hole to farm. You are saving yourself a tiny bit of extra scanning to find a highsec exit (no more than a couple of minutes if you know what you are doing) and one extra jump and this is apparently going to put a dent in your PI efficiency? I don't get it... care to explain? Also for 100m isk/hr C1 sites are really not worth it. Seriously, move up to a C4 with a C2 static. You'll have almost the same highsec access and nobody will bother you because C4s are just pointless to fight in (especially if you live in a C4 blackhole). Orcas rigged for maximum hauling is asking for trouble. Such orca outperforms a T1 industrial 3x for 100x higher price. It also collapses the hole in no time. @Smith: zombies do nothing. One checks for all kind of activities before calling "zombie". Also I did not say "ignore them", just "don't hunt them actively". C2s have 2-3x more ganks than C1s and much easier to evict someone due to bringing battleships. @anon: A c2 to c1 connection still has the c1 mass limitation so you still can't use anything larger than a t1/t2 industrial. Anything larger than a battle cruiser will not go into a c1. I am aware that orcas collapse holes. But you didn't answer the quesiton. How does living in a higher wormhole with a static that is LIKELY to have k-space access reduce your PI income? Also you can easily get an orca in and out of a hole from a C2 as long as it isn't mass reduced when you do so. And you should always keep a scanner toon at home so you can find a way back in later. A C4 with a C2 static might, on paper, be easier to evict you from, but the facts are that C4s are not desired and thus people don't generally evict from them. If you have direct highsec exit, you can only be caught by a really serious camp. If you don't, a pair of alts camping both sides of the C2-C1 wormhole can catch you. Also, evictions might not made because someone wants to move in. He can come for the loot or "just reinforcing stuff to get fights". Cool - doesn't answer the question. How does this adversely impact your PI efficiency? and surely any impact is offset by the additional static to farm out? Further, you wouldn't have a C1, the point would be to have a C*-C2-HS chain. A C1 is a pointless exercise if you intend to make decent money. Also you are right you could be camped at both sides. Chances are this would only happen in an eviction situation as people don't like sitting around for HOURS on end waiting for you to do something. That and you should maintain hole control (or at least know what is going on with your hole). Cloaky alts sitting near a hole listening for activation would give you a clue - you don't even need to be watching that account, just listen for the activation sound. I lived in a C4-C2 for years and never once got caught in such a camp, and can count on one hand the number of times someone even bothered to try to catch me in one. Typically people might shoot a tower to RF it. They wont go down the full eviction road in a C4 "just for fights". If all they do is RF your tower then so what? If you are super worried, put all your valuables in an orca and log it off safely. Also don't build deathstars, build dickstars (ewar towers). People can't stand to take them down with subcaps..they are just not worth the trouble. A dickstar pos in a C4 blackhole is not getting RF'd in a hurry. And you'll make a stack more isk, esp if you are farming the static. So even if you were evicted you would be financially in a better position. Sure higher risk, much higher reward. Is it possible to solo a C1 or C2 in a Ferox? That seems to be the ship I've come to love, and I'd like to try Wormholing. Evebattle-clinic fits look like they were thrown together for laugh value, but surely you have a fit that works? The reality of low class WH sites is that C2s are not worth running, ever, since L4 missions make you more isk at infinately less risk. C1s are worth day tripping if there are a lot of them in a single system and you don't want to run HS incursions. C3s are worth running solo if you dont want to run incursions and you are either day tripping or farming your C3 static. At the end of the day, HS incursions make more isk than any low class WH so running low class WH sites it just a matter of personal preference. If you want real isk out of WHs, you need to be running C5-6 sites and if you ARE running C5-6 sites, PI is a waste of time.